The Employment and Skills Service are now embedding Virtual Reality into lessons with one of the first being Astronomy. Using Google VR headsets and a Google Expeditions free app tutors have been able to take learners on a tour of the solar system and beyond even on a cloudy night. The immersive experience was incredible and there were actual gasps from learners as they observed what the Milky Way Galaxy can look like in a Dark Skies environment, which would be impractical for them to normally experience as part of the course. The Employment and Skills Team are working with our Housing Teams to launch an exciting new project to support social housing tenants. We will be using specific trigger points in the tenant lifecycle to engage with unemployed and economically inactive tenants with the aim of providing ‘total person employment support’ progressing individuals into work and thus supporting them to sustain tenancies. This is one of the first projects for the North of Tyne Combined Authority and partners include; Bernicia Homes, Karbon Homes Newcastle Futures, Northern Learning Trust, Northumberland County Council Housing Services; and Your Homes Newcastle. Between April 2019 and March 2022, we will work with 1650 tenants (a minimum of 215 in North Tyneside) supporting them into paid employment and housing tenure stability. 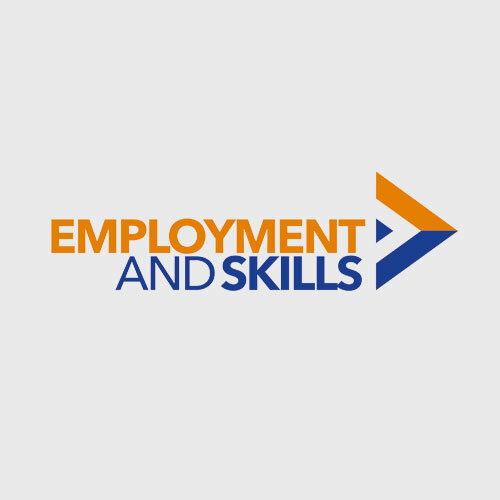 Over the past two years the Employment and Skills team have been key delivery partners in two regional Building Better Opportunities (BBO) programmes; Wise Steps and Moving on Tyne and Wear (MOTW). The projects are funded by The National Lottery Community Fund and European Social Fund (ESF). In February 2019, the BBO panel met to review the current BBO projects, and subsequently have agreed to an extension to both programmes. We are currently in discussion with the Lead Partners to develop our extended programme and expect to continue our intensive employability support for residents with health issues and multiple and complex barriers to employment. Employment and Skills staff and learners performed in the Festive show and raised £1200 from a range of activities including: baking cakes, making Christmas decorations, tin can alley and sponsored walks. This year saw our first group of SEND learners perform in the show and what a show they put on from Danny Adams pie sketch, to dancing and reading poetry. The charities were chosen because we have all been touched by their support throughout the year, to recognise the amazing work they do, these included Marie Curie and the British Heart Foundation, we also donated to one of our learners who is representing Great Britain in Judo at the Special Olympics in Abu Dhabi in March. The money was presented to the charities by our learners and the Elected Mayor who also received a DVD of the show. Local residents who have enrolled on foreign language courses with the Adult Learning team have been talking about their reasons for wanting to learn a new language, which includes preparation for employment, learning a new skill and to provide personal development. Learners who enrolled on the beginners classes in September have made excellent progress learning a wide range of phrases. They are also learning additional content, depending on their individual needs. The lessons are fun, relaxed and stimulating, and new friendships have been made. Most learners are planning to further increase their language skills by attending Improvers Classes from this coming autumn. Some previous learners have now moved to abroad where they have found a job. Many have continued to further classes, becoming more and more competent. A company director is using his very advanced German for communicating effectively with his business contacts in Austria. In today’s global society, the knowledge of foreign languages has become a vital asset. Generation NE is a major programme of employment support for young people aged 18- 29 which has been designed locally, in partnership with employers and Jobcentre Plus since 2014. In North Tyneside, the project has supported 966 young people to date with 751 (78%) moving into employment, further training and volunteering and work experience. 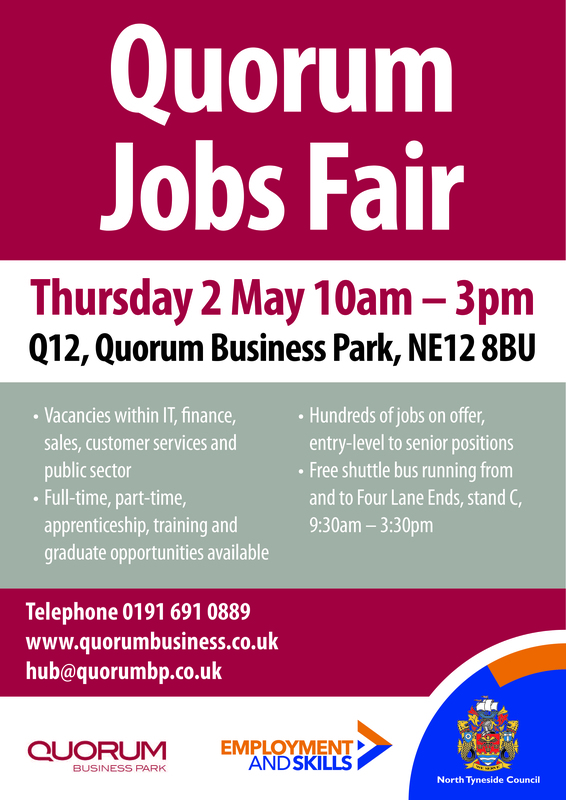 The annual Quorum Jobs Fair takes place on Thursday 2 May where hundreds of opportunities will be on offer for job seekers. 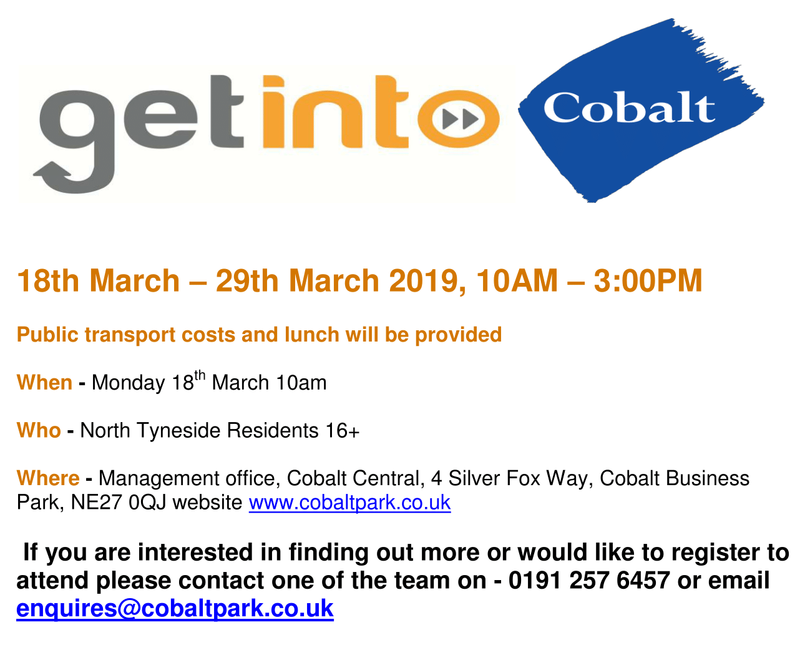 The event at Quorum Business Park in North Tyneside will showcase the various jobs that are currently available as well as upcoming opportunities. There will be vacancies within IT, finance, sales, customer services, shared services and public sector. Information about entry-level roles, graduate positions and senior posts as well as apprenticeship and training opportunities will be available. Quorum Business Park features major employers such as Engie, Tesco Bank, Balfour Beatty, Greggs, Concentrix, British Engines, Insure the Box, TSG and Home Group. 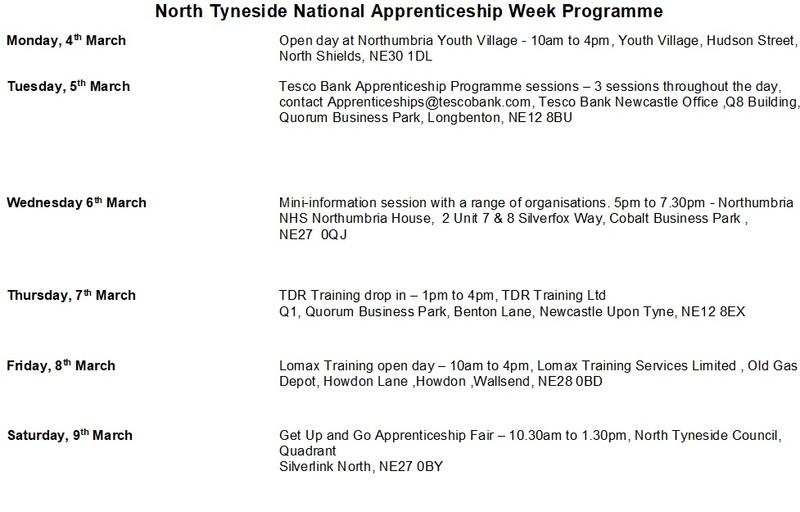 The event is organised by North Tyneside Council and Quorum Business Park. The Quorum shuttle bus, number 555 will operate a free service to and from Four Lane Ends between 9:30am and 3:30pm. The bus leaves from stand C at Four Lane Ends Metro Station. Quorum is one of the UK’s leading business parks offering superb accommodation, amenities and landscaping. Onsite facilities include the Kids 1st Nursery, Pure Gym, Greggs and the Eat@cafe, alongside sporting facilities such as tennis courts, a seven-a-side football pitch and table tennis tables. All staff at Quorum Business Park benefit from the Q card scheme. The Q card offers a variety of benefits including discounts at local restaurants, hotels, shops and entertainment venues as well as travel discounts on buses travelling to Quorum. Some of the world’s top companies are located at Cobalt including Accenture, EE, Siemens, Leeds and Newcastle Building Societies and Santander. Over 420 claimants have been provided with support by our dedicated UC Digital Support Officer since April 2018. The officer is supporting claimants to make UC claims online in Jobcentres, Customer First Centres and partner’s premises.